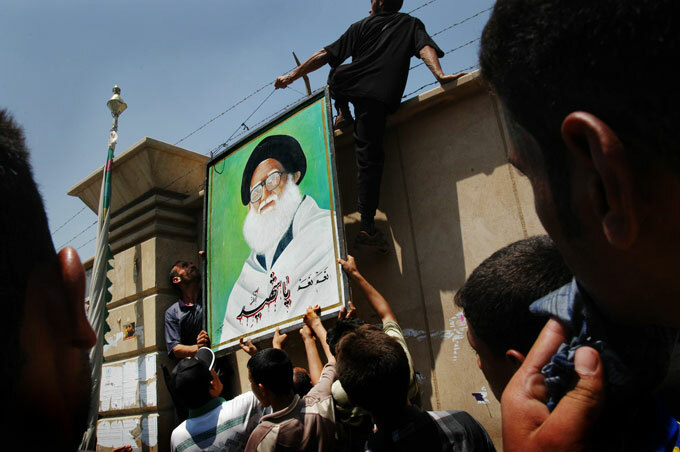 Demonstrators hang a picture of Muqtada al-Sadr’s uncle, Mohammed Bakr al-Sadr, a Shiite cleric who was assassinated for opposing Saddam Hussein, on a wall outside the green zone. The protest was in response to U.S. military actions against Muqtada al-Sadr and the Mahdi Army. Thousands of al-Sadr’s supporters participated, including some Iraqi police.